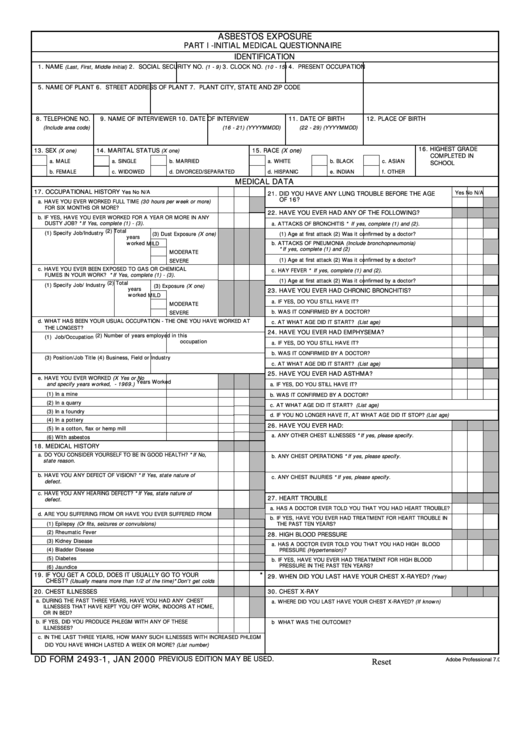 Download a blank fillable Dd Form 2493-1 - Asbestos Exposure Part I - Initial Medical Questionnaire in PDF format just by clicking the "DOWNLOAD PDF" button. Complete Dd Form 2493-1 - Asbestos Exposure Part I - Initial Medical Questionnaire with your personal data - all interactive fields are highlighted in places where you should type, access drop-down lists or select multiple-choice options. FOR SIX MONTHS OR MORE? 22. HAVE YOU EVER HAD ANY OF THE FOLLOWING? DUSTY JOB? *If Yes, complete (1) - (3). a. ATTACKS OF BRONCHITIS * If yes, complete (1) and (2). (2) Was it confirmed by a doctor? c. HAY FEVER * If yes, complete (1) and (2). FUMES IN YOUR WORK? *If Yes, complete (1) - (3). 23. HAVE YOU EVER HAD CHRONIC BRONCHITIS? a. IF YES, DO YOU STILL HAVE IT? b. WAS IT CONFIRMED BY A DOCTOR? 24. HAVE YOU EVER HAD EMPHYSEMA? 25. HAVE YOU EVER HAD ASTHMA? a. ANY OTHER CHEST ILLNESSES *If yes, please specify. b. ANY CHEST OPERATIONS *If yes, please specify. c. ANY CHEST INJURIES *If yes, please specify. a. HAS A DOCTOR EVER TOLD YOU THAT YOU HAD HEART TROUBLE? PRESSURE IN THE PAST TEN YEARS? 29. WHEN DID YOU LAST HAVE YOUR CHEST X-RAYED? b WHAT WAS THE OUTCOME?